Once, there a great sangat (congregation) came to to get darshan of Guru Gobind Singh Ji. Guru Ji appeared, dressed immaculately, looking radiant and handsome, as if the god of mammon himself was sitting there. It saddened the ‘Sangat’, when three days passed, the ‘Sangat’ became homesick. There were some Sikhs belonging to the ‘Malwa’ region. They had a lot of work to do at their homes. Not one of them dared to ask Guru Jee to let them go. So, they planned to flee from the Guru’s place. They got a bamboo-stair and made a bier from it. They put a man, who was alive, on it and pretended as if it was a dead body. The devotional singing was going on in the holy court of Guru Ji. These Sikhs pretended as if they were going to burn the dead body and started to go singing the holy hymns. They were singing the holy line, “Sevak Kee Orhak Nibhahee Preet“. One of the courtiers went to those Sikhs and asked what was the problem. 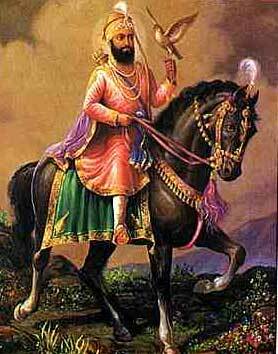 He came back to Guru Ji and said, “O true King! A Sikh has died”. Guru Ji ordered, “Bring him here”. The supplicant appealed, “O true King! The people are liberated by your holy view. They sing the holy hymns of the Guru. All the Sikhs will be liberated”. Guru Ji said, “If you want to see, put the bier on the fire secretly”. The supplicant went near the bier and put a log, which was ablaze, under it. The man, who was lying on the bier, felt the heat. He got up and made a ran for it tearing the shroud as he ran. The other Sikhs were stunned to see how some people were trying to deceive Guru Ji. The Sikhs, who organised all this drama felt ashamed. Guru Ji said, “Brothers! This Sikh will go to the heaven, because you were singing the holy hymns. Listen, had you succeeded to deceive, you would have gone to your homes and would say that Guru Ji makes no difference to the people as we tricked him. Your faith in the Guru would be lost”. Guru Ji gave them the permission to go.